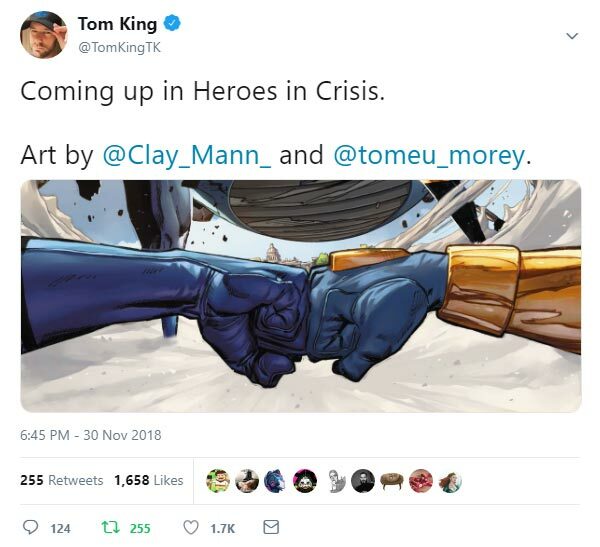 We've known since New York Comic Con back in October that King has been planning on pairing Blue and Gold for Heroes in Crisis. This tweet, presumably, is the proof that it is indeed coming. But how? The Booster Gold in Heroes in Crisis has never been a partner of any incarnation of the Blue Beetle (so far as we know), so is their first meeting? Or a reunion of a previously unseen, shared past in the DC Rebirth Universe? Or a vision in Booster's head generated by Sanctuary? For answers to these (and many other questions), we'll just have to keep reading future issues of Heroes in Crisis. I have been very confused by the Rebirth timeline. Like how one of the variant covers for Heros in crisis showed Wonder Woman killing Max Lord as part of her own trauma but that happened after he shot Ted Kord. Then I remember a reference from about a year ago that Boosterrific reported on, referencing ICE in the old league, which to me is the JLI (the best Justice League). But overall I am starting to enjoy Booster in HC. Tom King is definitely improving when it comes to writing our hero. You're confused because DC is making it up as they go along. Not much readers can do about that except try to enjoy the ride. If Booster Gold stole four super powers and then stole eight more, how many super powers has he taken in all? If Booster Gold had nine costumes and Doomsday destroyed seven of them, how many costumes remain?